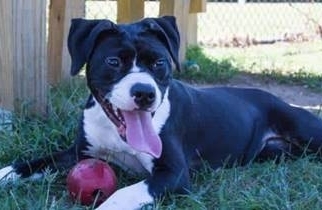 Tootsie is a friendly 6 month old beautiful black and white American bulldog/ boxer mix, medium sized, 43 pounds who came to AAHA from a local shelter. She will do best in a foster home instead of the kennel while we search for her furever home! She is much calmer and more trainable when outside of the kennel, but becomes stressed easily in the kennel surroundings. We are working with her to help her to learn her puppy manners. She is a very sweet, energetic pup who loves your attention! She will be a fantastic dog for someone given lots of love and consistent positive training!